Simple and delicious! 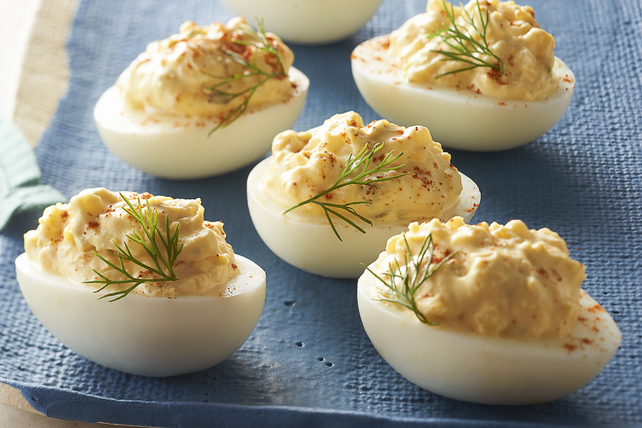 These devilled eggs topped with fresh spring herbs are a great addition to any potluck or buffet. Add Miracle Whip and mustard; mix well. Fill whites with yolk mixture. Spoon egg yolk mixture into small resealable plastic bag. Cut small corner from one bottom of bag; use to pipe filling into egg white halves. Garnish as desired, using chopped fresh chives, sliced green onions and/or small sprigs of your favourite fresh herbs, such as dill, parsley and/or cilantro.